Small or Minicar Equals Death Trap or Gas Savings? How about both. Recent frontal crash tests of Minicars made by Toyota, Honda and Daimler AG performed poorly. The test was conducted by the Insurance Institute for Highway Safety. 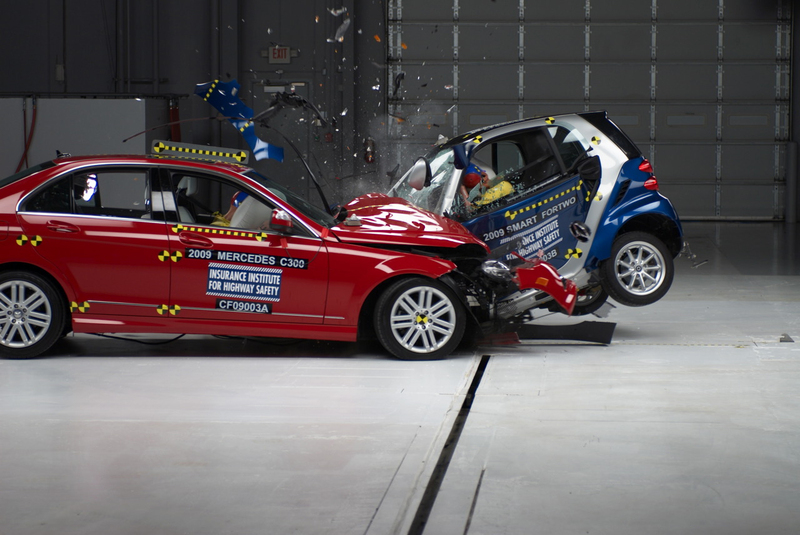 The Honda Fit, Toyota Yaris and Smart ForTwo collapsed in the impact of the test conducted. The test consisted of a frontal off-set crash head-on into one of the car makes sister mid-sized cars at about 40 miles per hour. Even with the protection of the airbags the study reviled a considerable amount of injuries to the head and legs of occupants in the smaller car. Even though you save on gas money you may ultimately put yourself at a greater risk for injury in this type of crash. Spokes persons and management of all three automakers explained that this is a very rare occurrence of an accident in the real world only accounting for less than 1% of crashes. Some may beg to differ with the stats and argue the case that size matters. Size does matter. It is rather obvious when you put the laws of physics in play especially (God forbid) matching one of these small cars up against a big SUV in an accident. The 2009 Toyota Yaris gets fuel economy of 29 mpg in the city and 35 on the highway and meets all safety standards and regulations. The 2009 Honda Fit gets 28 mpg in the city and 35 on the highway and meets all safety standards and regulations. The Smart ForTwo gets 33 mpg in the city and 41 mpg on the highway and also meets all safety standards and regulations. So whats the big idea? I will show you by allowing you to watch the video below. Three front-to-front crash tests, each involving a microcar or minicar into a midsize model from the same manufacturer, show how extra vehicle size and weight enhance occupant protection in collisions. These Insurance Institute for Highway Safety tests are about the physics of car crashes, which dictate that very small cars generally can’t protect people in crashes as well as bigger, heavier models. Laws of physics prevail: The Honda Fit, Smart Fortwo, and Toyota Yaris are good performers in the Institute’s frontal offset barrier test, but all three are poor performers in the frontal collisions with midsize cars. These results reflect the laws of the physical universe, specifically principles related to force and distance.